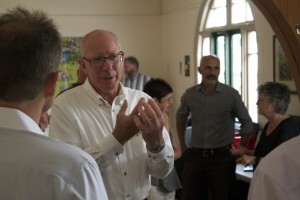 The NSW Governor, His Excellency General The Honourable David Hurley AC DSC (Ret’d), popped in to visit CoWS Near The Coast Digital Co-Working Space recently. The Governor has a keen interest in the Tech sector and was keen to see what is happening on the Sapphire Coast. Read more at the CoWS site or in the Bega District News.